BACKGROUND AND PURPOSE: Patients with acute CTO generally have a poor prognosis, despite IV or IA thrombolytic treatment. The goal of this study was to analyze the results of patients with CTO who had IA urokinase treatment with or without initial IV rtPA based on a bridging protocol. MATERIALS AND METHODS: Sixteen consecutive patients with acute ischemic stroke due to CTO who had combined IV and IA or a single IA thrombolytic treatment were enrolled. The baseline characteristics and prognosis were described. The patients who did and did not develop a PH shortly after treatment were compared. RESULTS: The mean age was 66.4 years, and the median initial NIHSS score was 17. The median dose of IA urokinase was 320,000 U, and recanalization (TICI grade II-III) was achieved in 12 patients (75%). However, 5 patients died and 10 patients had poor prognosis with mRS 5–6 at discharge. Six patients (37.5%) with a PH had a higher NIHSS score 1 day after treatment (26.7 versus 13.6, P = .002), and they had more frequent mortality (66.7% versus 10.0%, P = .018) and worse prognosis (mRS 5–6; 100% versus 40%, P = .016) at discharge than patients without PH. CONCLUSIONS: Patients with CTO who received IA urokinase treatment based on a bridging protocol had a poor prognosis. The development of PH might affect this outcome. CTO, which simultaneously involves the ICA and ipsilateral middle and anterior cerebral arteries, is one of the most fatal causes of acute ischemic stroke. The mortality has been reported to be approximately 50%, irrespective of the type of therapy.1–5 Recently, recanalization has been regarded as one of the most important predictive factors for patients with acute ischemic stroke.5–7 Endovascular treatment is powerful to in its ability recanalize major occluded cerebral arteries. IA urokinase infusion has been a treatment option since the PROACT II trial was published.8 Specifically, IA pro-urokinase infusion in patients with acute ischemic stroke achieved a much higher recanalization rate and better outcomes. The MELT study also showed more frequent excellent outcomes and mRS scores ≤1 in patients who received IA urokinase infusions than in those who were treated conservatively.9 Because the recanalization rate with IV rtPA is very low,6,10 additional IA chemical treatments have also been tried. Bridging thrombolytic treatments have been reported to be feasible and effective in recanalizing occluded cerebral arteries.11–15 Nevertheless, the effects of bridging therapy on patients with CTO and large thrombi have not been reported. In this study we report our experiences by using IA urokinase infusions for recanalization of patients with CTO. According to our bridging treatment protocol, patients received IA urokinase treatment with or without an initial IV rtPA infusion based on the onset-to-treatment interval. A PH was the focus as a prognostic factor in patients with acute ischemic stroke and CTO. Between February 2006 and March 2009, 16 consecutive patients with acute ischemic stroke due to CTO who received an IA urokinase infusion were enrolled in the study, which was conducted at a university hospital. Those who had received other IA thrombolytics or mechanical thrombolytic treatments other than microwire disruption were not included in this study. CTO was diagnosed by initial CT angiography. All data, which were retrieved from the prospectively collected data base of the stroke registry, were retrospectively reviewed. The indications for IV rtPA (0.9 mg/kg) were applied according to the NINDS rtPA Criteria,16 with the exception of age. In brief, patients were included who had acute stroke syndrome, based on an examination by neurologists, an onset-to-decision interval <3 hours, and no evidence of hemorrhage on the initial nonenhanced CT. The indications for IA thrombolytic treatment were severe neurologic status, major cerebral artery occlusion on CT angiography, and a duration of onset-to-presentation within 5 hours. Informed consent for endovascular treatment was obtained from patients or their legal representatives. Immediately after the patients in whom symptoms were suspicious for stroke arrived at the emergency department, a CT scan (including nonenhanced and enhanced axial parenchymal images) and CT angiography were obtained. The patients who were diagnosed with acute ischemic stroke were classified according to a bridging thrombolytic protocol through a critical pathway. The CT angiography was reconstructed with maximal intensity projection and a volume-rendering technique. IV rtPA was induced when the infusion was started within 3 hours after symptom onset. Patients without contraindications for endovascular treatment were brought to the angiographic suite and treated with the IA approach as soon as possible if the onset-to-decision interval was <5 hours, irrespective of IV rtPA infusion. Recanalization was determined by the final angiography, which was obtained immediately after the thrombolytic treatment was completed. 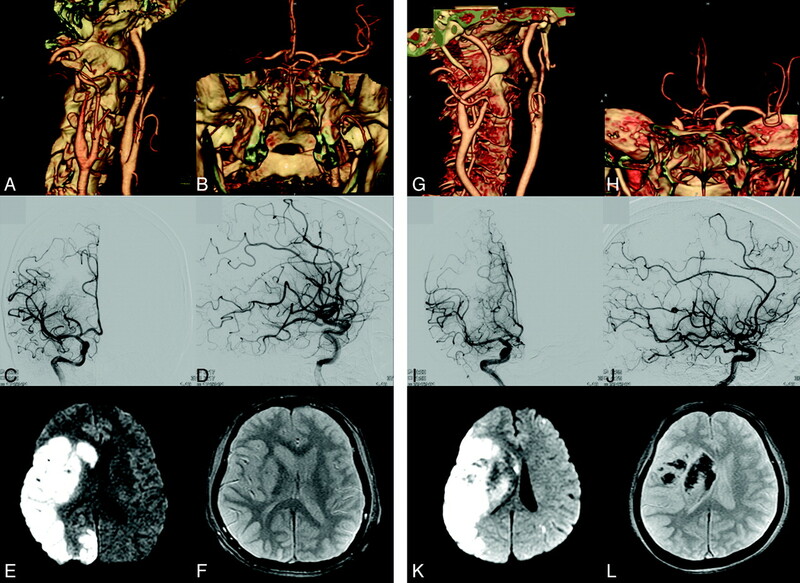 Immediately after the endovascular procedure was completed, a nonenhanced CT was obtained. MR imaging, including diffusion-weighted imaging, was performed within 1 or 2 days after onset. A follow-up CT scan and CT angiography were performed within 4–7 days after the onset of symptoms. Neurologic scales were checked daily until discharge and every 3 months thereafter. A guiding catheter (Envoy; Cordis, Miami Lakes, Florida or Shuttle-SL guide sheath; Cook, Bloomington, Indiana) was used to select the ICA. In most cases, after the length of the thrombus was measured with a microcatheter (Excelsior SL-10; Boston Scientific, Natick, Massachusetts) and a microwire (Transend, Boston Scientific), the distal tip of the microwire was shaped like a pigtail, as modified according to a previously reported method.17 The curved loop of the distal tip was repeatedly passed into the thrombus to achieve mechanical thrombectomy. Urokinase (10,000 U/mL for 1 minute) was manually infused at the distal portion of the thrombus first, and subsequently in the middle and proximal portions. Baseline patient data, including vascular risk factors, stroke etiology, laboratory and radiologic results, and initial neurologic severity scales were recorded. The ASPECTS was evaluated on the initial nonenhanced CT.18 The collateral vessels in the Sylvian area and the anterior and posterior communicating arteries were evaluated by maximal intensity projection images of CT angiography, as modified by a previously reported method.19 The ipsilateral collateral vessels were regarded as “decreased” when the arterial attenuation was less than that of the contralateral vessels. Clinical outcomes were measured by the NIHSS score on the day following revascularization therapy, and mRS at discharge and 3 months and 1 year later. Radiologic outcomes were determined by the modified TICI grade,20,21 and ICHs were classified according to the ECASS study.22,23 In brief, each TICI grade was defined as follows: 0, no perfusion; I, minimal perfusion; IIa, partial filling of less than one-half of the occluded arterial distribution; IIb, partial filling of one-half or greater of the occluded arterial distribution; and III, full perfusion.20 Recanalization was defined as TICI grades IIa, IIb, or III for this study. 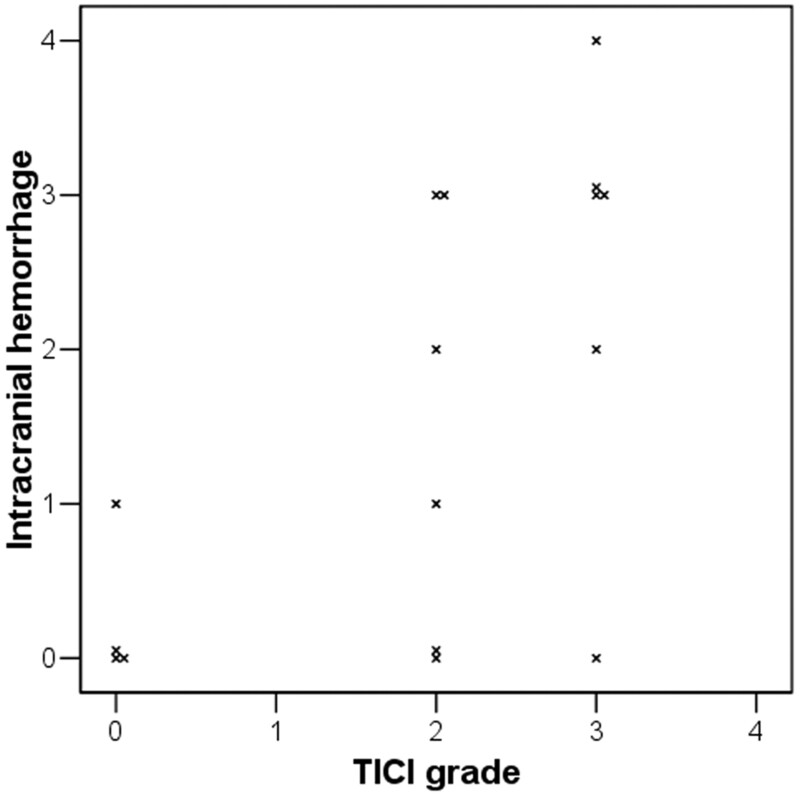 We included TICI grade IIa as recanalization because the leptomeningeal collaterals are associated with a better prognosis, even though the main branch, such as the middle cerebral artery, is not recanalized.2 The classification of hemorrhages was defined as follows: hemorrhagic infarction type I, small petechiae along the margins of the infarcts; hemorrhagic infarction type II, more confluent petechiae within the infarcted area but without a space-occupying effect; PH type I, blood clot <30% of the infarcted area with a mild space-occupying effect; and PH type II, attenuated blood clots ≥30% of the infarct volume with a significant space-occupying effect.23 Finally, to evaluate the association of the development of PH with prognosis, patients were classified into 2 groups according to the presence or absence of PH. To compare the frequency and continuous values, the X2 test and t test were used, respectively. To evaluate the relationship of the degree of ICH with the degree of recanalization, the degrees were reordered as an integer. Thus, the degree of ICH was ordered from 0–4, representing no hemorrhage, hemorrhagic transformation types 1 and 2, and PH types 1 and 2, respectively. The degree of recanalization was also reordered from 0–4, representing TICI grades 0, I, IIa, IIb, and III, respectively. The Spearman correlation coefficient was calculated for correlative analysis. A P value <0.05 was considered statistically significant. Statistical analyses were performed by using a commercially available software package (SPSS, version 12.0 for Windows; SPSS, Chicago, Illinois). The demographics, risk factors, and clinical information are listed in On-line Table 1. The 16 patients who were enrolled consisted of 10 men and 6 women. The mean age was 66.4 years (range, 52–85 years). The median initial NIHSS score was 17 (range, 7–25). Eight, 7, and 1 patient(s) had right, left, and bilateral ICA involvement, respectively. Cardioembolism and atherosclerosis were the etiologies underlying occlusion in 12 (75%) and 4 patients (25.0%), respectively. The vascular risk factors included hypertension in 8 (50.0%), diabetes in 3 (18.8%), atrial fibrillation in 12 (75.0%), valvular heart disease in 4 (25.0%), smoking in 3 (20.0%), metabolic syndrome in 6 (37.5%), and previous stroke in 3 patients (18.8%). Four (25%) and 2 patients (12.5%) had taken any type of antiplatelet medications and anticoagulants, respectively. IV rtPA was administered to 8 patients (50%). The median dose of urokinase was 320,000 U (40,000–700,000U). Recanalization was achieved in 12 patients (75%). Six patients each had TICI grades IIa and IIb; however, there was no complete recanalization. Overall, 10 patients (62.5%) had postintervention ICH; hemorrhagic transformation type 1, hemorrhagic transformation type 2, PH type 1, and PH type 2 occurred in 2 (12.5%), 2 (12.5%), 5 (31.3%), and 1 patient(s) (6.3%), respectively. A subarachnoid hemorrhage occurred in 1 patient (6.3%). Craniectomies with or without lobectomies were performed in 3 patients (18.8%). The prognosis was not favorable; mortality rate was 31.3% at discharge, 53.8% at 3 months, and 66.7% at 1 year after onset (Fig 1). 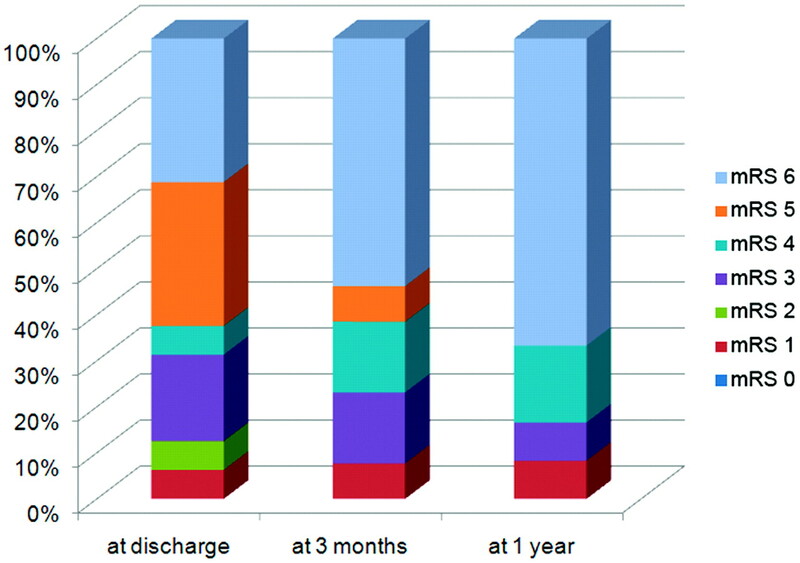 The rate of patients with mRS 4–5 was 37.5% at discharge, 23.1% at 3 months, and 16.7% at 1 year after onset. Functional outcomes as judged by mRS after IA urokinase with or without prior IV rtPA treatment for CTO. The severity of postintervention ICH was associated with the recanalization grade (Figure 2). When the ICH and TICI grades were reordered by severity, there was a correlation and statistical significance (Spearman coefficient R = 0.595, P = .015). There were significantly more patients having a poor prognosis (defined as a mRS 5 or 6) in the group with PH than in the group without (On-line Table 2). Age (71.0 versus 63.6 years, P = .241) and initial NIHSS score (19.0 versus 14.8, P = .064) tended to be higher in patients with PH than in patients without PH but were not statistically significant. However, prior IV rtPA infusion was significantly more frequent in those with PH than without PH (83.3% versus 30.0%, P = .039). With respect to short-term prognosis, the NIHSS score 1 day after treatment (26.7 versus 13.6, P = .002) was higher, and mortality (66.7% versus 10.0%, P = .018) and a mRS score of 5–6 (100% versus 40%, P = .016) at discharge were more frequent in patients with PH than in patients without PH. The significant difference of mortality and mRS 5–6 was also shown at 3 months and at 1 year. Representative radiologic figures for patients with or without PH are shown in Fig 3. Patients with and without prior IV rtPA were grouped and compared; however, there was no significant difference in baseline characteristics and outcomes (data not shown). Relationship of the degree of intracranial hemorrhage with that of recanalization after intra-arterial urokinase infusion. Both degrees are shown to have positive correlation (Spearman correlation coefficient R = 0.595, P = .015). Illustrative figures for patients without PH (A-F) and with PH (G-L), respectively. Initial NIHSS scores of patients 7 and 15, who had right major hemispheric syndrome and CTO on CTA (A-B and G-H), were 16 and 18, respectively. They had taken IV rtPA and IA vrokinase 400,000U and 300,000U, respectively. Their CTO was recanalized with TICI IIb (C-D and I-J), but a large area with diffusion restriction was shown (E and K). Whereas patient 7, whose gradient-echo MR imaging revealed no hemorrhage (F), had relatively good outcome with mRS 2 at discharge, patient 15, whose gradient-echo MR imaging showed PH type 1 (L), had poor outcome with mRS 5 at discharge. Since IV rtPA was developed and approved in the mid-1990s, more patients with acute ischemic stroke have survived and been relieved from grave morbidity compared with the natural course of acute ischemic stroke.16 Nonetheless, the so-called CTO is still associated with a poor prognosis and high mortality rate.1–5 CTO must be associated with a large clot burden because large-caliber arteries, such as the ICA and its 2 major branches (the anterior and middle cerebral arteries), are concomitantly occluded. Thus, the recanalization rate is too low and the prognosis is not good despite IV rtPA infusion.1,6,10 IA thrombolytic infusion also has been tried in severe cases, but the prognosis was not favorable.1,5 In this retrospective study, a bridging protocol, based on IA urokinase treatment with or without prior IV rtPA infusion, revealed that the prognosis of patients who had acute CTO was still poor. Our data showed that a poor prognosis existed especially when the patients with acute CTO had PH after the intervention. This result is consistent with a previous report in that all patients who received IV or IA chemical therapy for recanalization of CTO died when PH was found on CT after treatment.1 With respect to mechanisms, PH might be affected by reperfusion injury and chemical toxicity because all patients with PH had recanalization after intervention. Selection of the most appropriate drug among thrombolytics seems to be another important factor for additional IA thrombolytic treatment. Despite a recent study that showed a full dose of IV rtPA followed by an IA thrombolytic infusion was relatively safe and achieved a high recanalization rate and a favorable outcome, urokinase appears to be relatively harmful compared with 3 other types of thrombolytic drugs such as reteplase, alteplase, and urokinase.15 Of 6 patients with additional IA urokinase infusions, 2 had symptomatic ICH and 4 died. Reteplase and alteplase appear to be relatively safe. In the previous PROACT II and MELT studies, by using pro-urokinase and urokinase, the rates of symptomatic ICH (10% and 9%, respectively) were relatively high without prior IV rtPA infusion.8,9 Against this background, selection of a new-generation thrombolytic other than urokinase as a boosting thrombolytic drug should be considered. Our data were strengthened by a relatively homogeneous study cohort with IA thrombolytics without other IA mechanical or combined recanalization techniques. However, group comparison might possess low statistical power and independent predictors, for the occurrence of PH could not be achieved due to the small number of patients. Factors such as age, NIHSS score on arrival, and decreased collaterals could have confounded our results and would be better controlled in a larger cohort study with multivariate analysis. For getting more consistent results, analysis with data gathered from various centers will be needed. Moreover, whether mechanical revascularization techniques rather than IA thrombolytics are more effective in patients with acute CTO should be studied. Cerebral infarction resulting from CTO caused poor prognosis despite IA urokinase treatment. The prognosis was associated with the development of parenchymal hematoma. Newer mechanical recanalization methods are warranted for CTO treatment because a lower rate of hemorrhagic complication is expected. This study was supported by a grant of the Korea Healthcare technology R & D Project, Ministry of Health & Welfare, Republic of Korea (A100463-1001-0000100). Accepted after revision April 27, 2011. What Is Meant by "TICI"?